“This is a big one for us. As we know, and those of you know that have been around here, it’s all about when you get hot, when you start playing good football, and for us the time is now. We need to start playing our best and put together a little run here.” — Ben, on this weekend’s game against Dallas. Was “readiness to play” or the lack of addressed this week in reference to the San Diego game? I didn’t see that from the people I was around. I sensed maybe a little bit of trying to get it energized and get it going a little bit. I think everyone is ready to play. I don’t think it has been addressed really this week. I think you’ll see from guys who’ve been around here for awhile that it’s that time you’ll start seeing some leaders stepping up on the ways on how to practice. And hopefully young guys will take some cues from that. Is there a “sense of desperation” now, especially with Cincinnati losing last week as well? No. Every game for us right now is big. It doesn’t matter if it’s AFC or NFC, Cincinnati, whoever it is…We need to come out and play ball. I don’t want to use the word ‘desperation’ because I don’t feel desperate. I just feel we need to put it together and play the ball the way we know how to play ball. Did he feel an inability to get into a rhythm on Sunday? I don’t know if the rhythm, or lack thereof last week had anything to do with injury. I think I did come out a little anxious, a little rusty, but we just couldn’t put it together. From one phase of offense, one position, on any particular play, it wasn’t like we had any two positions doing the right thing. It was one of those funky things, and I think we’ve got it corrected. Jokingly asked if Tony Romo is “on the list”: one of those quarterbacks he has a personal competition with? On whether there was any talk of him leaving the game early last week because of the lopsided score? Not that I know of…I would not want to come out, no matter what the score was. That’s just not me. I want to be out there. I never want to quit. Was the protective vest helpful? I didn’t even wear anything different, other than I had a little bit of padding on the outside of my shoulder pads and that was a little bulky, so I took it off. On how he feels three days post-game? Normal Wednesday. No major setbacks so I feel pretty good. 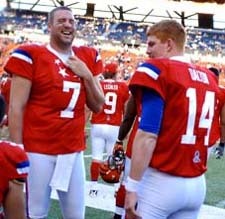 Pro Bowl voting is winding down…. And Ben is trailing Peyton Manning (823,372 votes), Tom Brady (746,710 votes), and rookie Andrew Luck (318,128 votes) in AFC quarterback voting with 302,583 votes! Steeler Nation, we can do better than that!! Ben has 2,742 passing yards, 20 touchdowns with 5 interceptions, and a quarterback rating of 98.6! 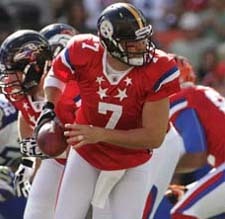 Vote for Ben and his teammates to play in the 2013 NFL Pro Bowl!! “We’re trying to get him to the Pro Bowl. He’s deserved it for a long time. Heath is a weapon and we have to continue to use him out in the field and in the red zone. Like I’ve always said, he blocks like a lineman and catches like a receiver. 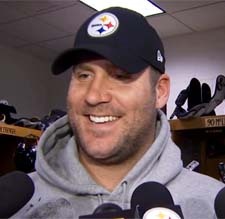 If we keep utilizing him it will be big.” — Ben on TE Heath Miller, from an interview on September 19, 2012.